The success of any retail business is based on its ability to respond to the surrounding community. Can you give the customer what they want? A business that sees itself as part of the community can take that relationship one step further, as it not only supplies the regional customer base with goods, but gives those customers a central place to meet, shop and be a part of things. In the olden days, that would have been a local general store. In 2008, it’s also the general store, or at least that’s the case in Parkdale. Opened in 2006, the Good Catch General Store on Parkdale’s main drag has always been about welcoming the neighbourhood. Owners Jola Sobolak and Daniel Hickox filled their shop with a little bit of everything – from handmade toys, to works by local artisans and crafters, to jewelry, candles, environmentally-friendly cleaning products and organic food stuffs. That fun mishmash still exists, as noted in the array of guitars on the wall behind the cash and the rack of vintage garments in the back, but in the past six months, The Good Catch has become known more and more as the place to go for food and now everything from soup to cheese and bread take up over half the shop. Location means a lot and Good Catch is the only shop of its kind in the Parkdale area. But customers keep coming back because Sobolak and Hickox keep their shelves full of great organic, fair trade and locally-made products, and are responsive to customer input. 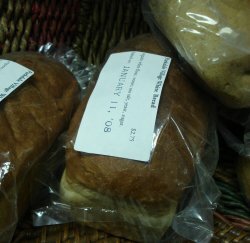 Customers asked for bread, the Good Catch brought in fresh baked bread from Parkdale Village Bakery. 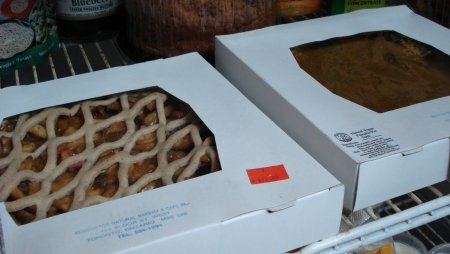 A request for vegan pie lead to a weekly delivery of pies, butter tarts and brownies from Kensington Natural Bakery. 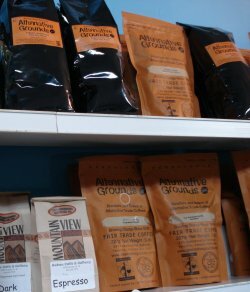 Coffee from local purveyors Alternative Grounds, as well as green beans fill a shelf. The addition of a fridge last year means the Good Catch now stocks a variety of raw milk cheeses, vegan cheese and organic milk, as well as freshly made dips and spreads. A freezer holds Tofurky feasts and Sobolak explains plans to expand the freezer section and work with neighbourhood restaurant Cowbell (where chef Mark Cutrara butchers his own meat) to offer organic beef at retail. 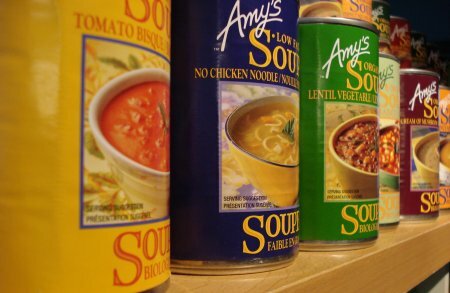 The shelves are also stocked with health food store basics such as soups, condiments, and teas, as well as organic sugar and different types of flour. 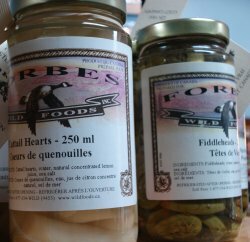 The full product line from Forbes Wild Foods has pride of place on a display near the cash, offering everything from daisy capers to pickled fiddlehead ferns. They’ve not forgotten the snacks though, and Sobolak points out a display of organic chocolate treats from Etobicoke shop Sitting Around Eating BonBons. They’ve always carried a great selection of organic and fair trade chocolate, and the addition of a line of gluten-free treats from Darryl’s All Natural Hi-N-R-G Bars have been a huge hit. Healthier snacks include muesli from Dandelion Food and Herbs, cocoa nibs from Nanitas, and a 100% raw trail mix from Ethniscience. Hickox says they add new inventory items about every two weeks, often at the request of customers, but also from suppliers approaching them because of the positive, customer-oriented reputation they’ve gained. The only thing missing from the shelves is fresh fruit and vegetables, and Sobolak even has an answer to that. Good Catch has recently become the local drop off point for Foodshare’s weekly Good Food Box delivery in which members receive a box of local and/or organic produce at very reasonable prices. To save on delivery costs, boxes are delivered to a central pick-up point in each neighbourhood. Sobolak also talks of expanding her lines of toiletries and says they’ll soon being carrying packages of recycled paper plates, napkins and cups from GreenShift. She recognizes that even the most ethical customers occasionally throw a party and want environmentally-friendly alternatives to the typical plastic and styrofoam. The couple have so far been able to achieve their vision of a business that is not only profitable but which truly serves the community. Besides their support of local food producers, they host regular events throughout the year to showcase the work of local crafters, designers and artisans. Their enthusiasm for their business, their products and the community in general is infectious. In that regard, The Good Catch General Store is truly a success. By responding to their customers’ needs with ethical, environmentally-friendly products and warm and welcoming customer service, Sobolak and Hickox have cemented their role in the community for years to come.